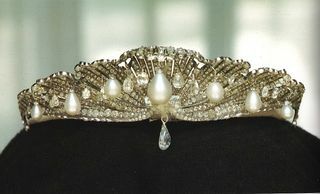 Mellerio Shell Tiara Created for the Infanta, Queen Isabelle II of Spain,1867. The Mellerio family, jewelers and goldsmiths for generations, originated from the Lombardy region of Italy. Since 1613 they have been documented as goldsmiths and jewelers in France. The family firmly established themselves as important Parisian jewelers under the leadership of François Mellerio (1772-1843), who set up the foundations of the current house, Mellerio dits Meller. In 1815, he went into partnership with his brother, Jean-Jaques and moved the company’s address to its current location on the fashionable rue de la Paix. The business prospered and grew rapidly under the patronage of the Duc d’Orleans and in 1830, became an official supplier to the royal house of Queen Marie-Amelie and King Louis-Phillipe. During the economic crisis of the 1848 revolution, it was decided to open up a branch in Spain and the shop, Mellerio-Hermanos opened its doors in Madrid in 1850. The Madrid shop also prospered, receiving large orders from Queen Isabella and other grandees of Spain. Mellerio dits Meller participated in many of the international expositions. They exhibited to great acclaim in the London World Exhibition of 1862, in Paris in 1867, in Vienna in 1873, and again in Paris in 1878 and 1900. They also exhibited in The Exposition des Arts Decoratifs 1925 and the 1939 World Fair in New York. The company has remained in the family and is currently run by François and Olivier Mellerio. Peacock feather motifs were a prominent design element. Jean Baptiste Mellerio opens on Rue Vivienne. Move to Rue de la Paix. Emperor & Empress are clients. Princess Mathilde is a customer. Designed & created sporting awards. Queen Isabella II of Spain becomes a customer. Paris – Move to Place Vendà´me. Modified Art Nouveau style often with gem-set, green gold peacock feather motifs.